During a ten week trip through China, I added over 150 contacts on WeChat, China’s overwhelmingly dominant messaging app. If we weren’t being introduced by mutual friends online, we usually used the most common way for people to add each other in the app: one person presents their WeChat-generated contact QR code while the other aims a scanner and waits for a confirmation beep. Like a handshake or the passing of a business card, the scanning of a QR code has become a ubiquitous gesture increasingly read as a social performance; a digital first impression. At its best, it’s a playful, suggestive interaction charged with the palpable potential energy of a new relationship. Over the course of my trip, new friends would sometimes initiate the ritual simply by thrusting their phones at me wordlessly mid-conversation, QR codes already pulled up; confidently expectant. Most people were more tentative, asking for consent first before offering me a choice by asking: “我扫你还是你扫我?” — ”Are you scanning me, or am I scanning you?” In other words: are you a QR top, or bottom? After pulling up their in-app QR scanner and successfully scanning a code, the QR top is presented with their new acquaintance’s contact card. From there, they can send a friend request which must be accepted by the QR bottom before two-way messaging can happen. 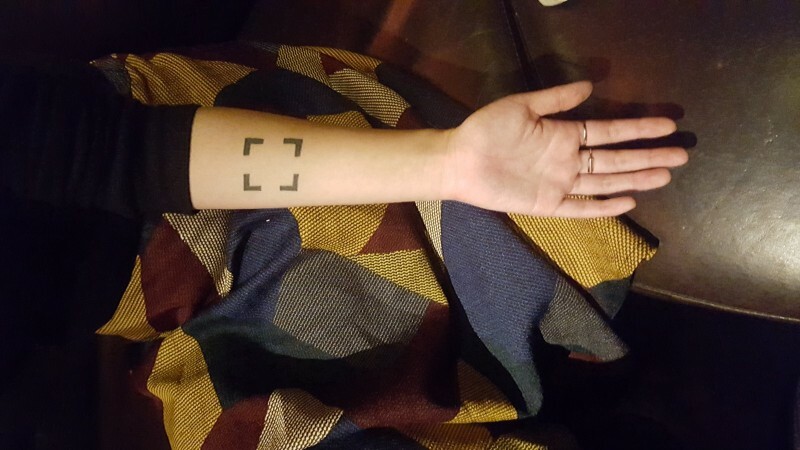 This power dynamics of QR code scanning manifest physically, too. Being a QR top certainly requires marginally — marginally — more skill and effort: the QR bottom holds their phone steady while the QR top adjusts around it, hovering like an attendant. 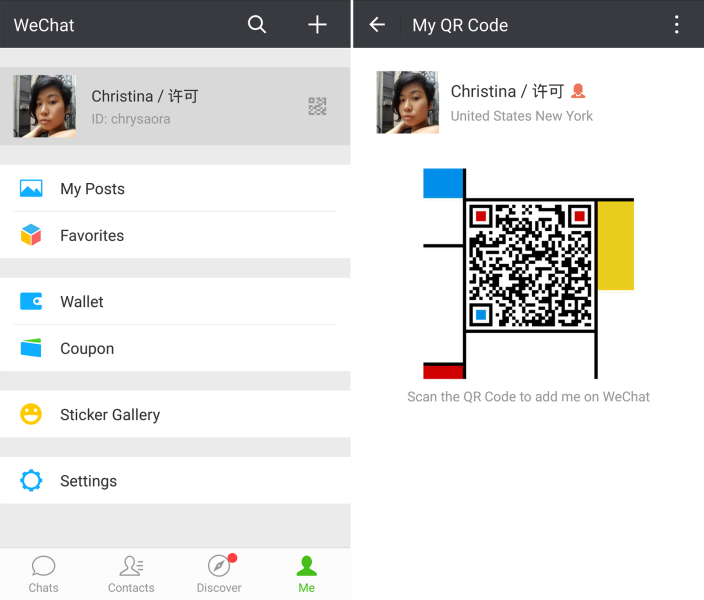 WeChat’s in-app QR code scanner is preternaturally effective, but it still requires a bit of manual aiming. 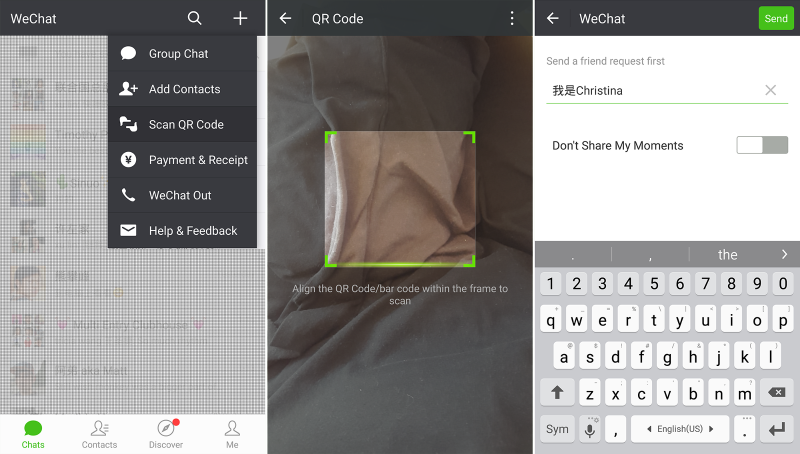 From a financial standpoint, QR topping is also slightly more expensive — the scanner needs to send the request to WeChat’s servers to look up the encoded contact information, using up a tiny bit of data. Three of the people polled said that they preferred to be scanned because it was less of a hassle. For some people, this intentional passivity conveys a confident power: you handle the messy part, I’ll sit here and wait. For others, it’s a result of technological illiteracy: some older users who aren’t familiar with the app reported simply handing their phone over to the other party because they don’t know how to find the QR code at all. The QR bottom just pulls up their QR code and waits. Later, they’ll be able to find the other party’s friend request in a tucked-away part of the Contacts tab. Social graces play into the ritual of the QR code scan as well. Of the two participants, the QR bottom gets the last word: before two-way messaging can begin, they must first reciprocate the friend request, then send the first message. This multistep process gives the QR bottom the optionality to quietly reject a connection with the safety of plausible deniability — ”I never received the request!” or even “I thought I added you back, but I guess I forgot to send a message.” Being someone’s WeChat friend means that they now have the ability to ask you for favors, to invite you to spend more time with them, to share pieces of their lives with you through Moments. The ability to gracefully control whether that happens or not is no small power. The remaining respondents to my QR code scanning survey claimed flexibility: either they let the other person choose, or they have no preference at all. Sometimes, the roles are determined by necessity alone: if only one person has cell phone signal, they have to be the scanner. Personally, I’ve found myself at many places on the spectrum depending on the situation. On some occasions, I’ve pulled up my QR code and willingly handed my phone to the new acquaintance, displaying a level of trust that would have felt mildly transgressive back home in the US. When I’m particularly thirsty for a new friendship, however, I pounce on the opportunity to be the scanner to demonstrate my eagerness, my promise to put similar effort into staying in touch. There’s something beautiful about watching a simple, designed digital interaction accumulate layers of familiarity and tradition through repeated use, a trellis becoming overgrown with vines and taking a shape both inorganic and organic. Our phones, smudged with our oil and sweat, have become extensions of our social — and increasingly, physical — selves. When these personal devices are made to nearly touch, it’s an intimate gesture that has the ability to convey identity, power, and intention. Is technology making us less social? No, because though there may be a period of hesitant acclimation, our sociality eventually always swallows everything else for its own needs. Thanks to Jane Chun, Diana Kimball, Matt Boch, Jaime Woo, and Carlin Wing for helping me think through these ideas. This piece is a part of Multi Entry, a decentralized collection of stories and media about the creative young people of modern mainland China and the culture they’re creating.